1957 Vini d’Italia, Vins d’Italie, Wines of Italy, Italienischel Weine - the Vintage Map Shop, Inc. 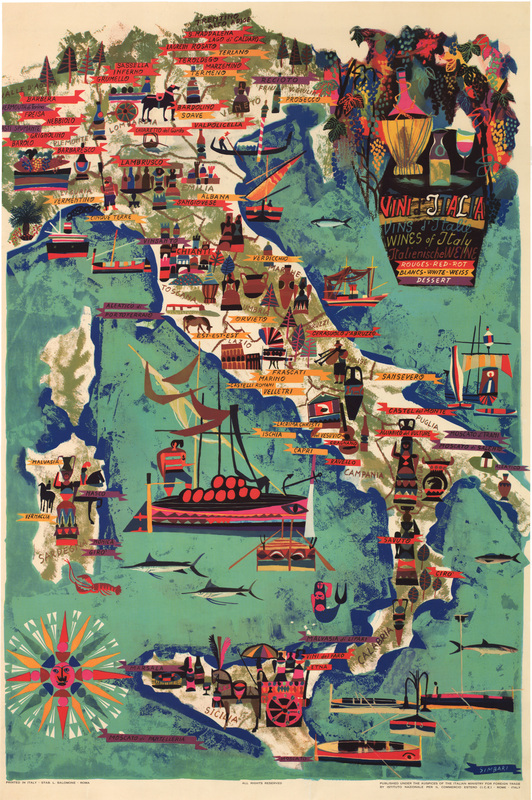 This is a fine print reproduction of a marvelous, brightly-colored poster / map of the Wine Regions in Italy, created by Nicola Simbari, one of Italy’s most important modern artists. Published by the Italian Ministry for Foreign Trade, it is a splendid advertisement for Italy’s myriad world-class wines, with each region noted for the wine which it produces. Born in Calabria, Simbari grew up in Rome, where his father was an architect for the Vatican. At the age of 13, Nicola enrolled at the Accademia di Belle Arti di Roma and in the 1940s he began devoting himself to painting in a studio at Via del Babuino in central Rome. Geometric forms and architectural structures are incorporated in almost all of his work. He developed a distinct style which stemmed from his impressions of life, nature and the Mediterranean at an early age.